At the point of this x-ray Felipe has been performing LSJL for three months with no reported height gain but has reported an increase in knee thickness and width. 4 months after the x-ray's still no increase in height. He had been doing MENS routine for 2 years. MENS is just a fancy name for taking melatonin and high dose niacin.. It is not really a height increase routine. He reports loading for 3 minutes for very high pressure. Of note that at this point he was loading at the bumpy part of the bone rather than at the synovial joint intersection. Here's what open tibial growth plates look like. 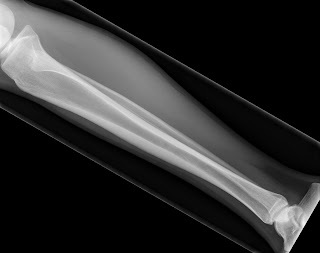 A growth plate shows up as a gap in the bone in the xray. 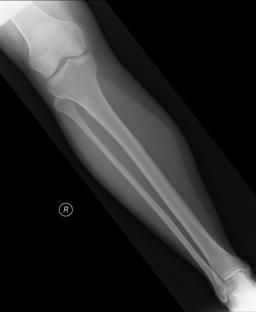 Here's what a normal tibial x-ray looks like. That's what an enchondroma looks like. 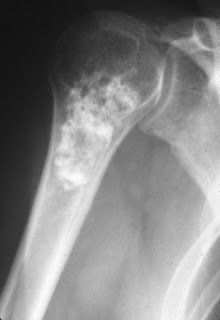 That's what a chondrosarcoma looks like. What's interesting to note is that while a growth plate just presents itself on a gap in the x-ray. An enchondroma(ectopic endochondral ossification) and a chondrosarcoma(ectopic cartilage formation) are both visible. However, both sarcomas consist of both cartilage/bone cells and tumor cells so maybe it's the tumor cells that are visible and not the cartilage cells. Felipe's x-ray is much whiter on the perimeter of the bone than the normal x-ray(which is more gray) indicating enhanced bone density. This is despite the fact that the normal x-ray individual has a much more muscular calf than Felipe. Felipe's x-ray is hollower in the middle of the bone. Note that in the LSJL study involving drilling, LSJL caused degradation in the middle of the bone. The normal x-ray no longer has a visible epiphyseal line(scar) whereas Felipe does so the normal person is likely older than Felipe. After the 3 months of these x-ray's Felipe loaded his knees for four minutes(high intensity) and loaded his ankles for two minutes(also high intensity). Unfortunately these were the best x-ray's of the normal tibia I could find so if you could provide links to other x-rays that would be helpful. For example, this person may be fatter than Felipe which may present itself as adipose tissue in the bone marrow which would also explain why Felipe's x-ray is clearer. 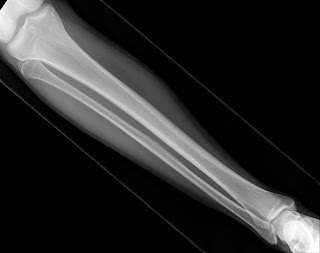 X-ray's of athlete tibia's would be helpful. Since growth plate's present as a gap and it's likely that the visible tissue present in other forms of ectopic cartilage formation are other types of tumor cells. The hollower state of Felipe's bone indicates that there is room for growth plate formation. You can see clear through the fibula to the tibia in contrast to the normal xray. It could be due to x-ray quality but the quality of the muscle and fat seems to be the same on both x-rays. Also, in Felipe's bone you can see streaks within the bone which may be signs that LSJL induced shear strain and fluid flow. Even with shifting the load from the bone to more the synovial joints Felipe still didn't gain (visible) height and he reported increasing the load from three to four minutes. He also stated that he did not use a deconditioning period. Three minutes(high intensity) of LSJL is enough to degrade bone making room for growth plates. It is not enough to complete formation of new growth plates. Thus 5 minutes may be the minimum if not longer. Human bones are much longer than rat bones so it may take more time for fluid to travel within the bone and build up hydrostatic pressure to induce chondrogenesis. He is 19 years old and his bone age is 19 too,doctor told him he wont grow anymore and he hadnt growth over 3 years,and he is wondering to open his tibia and femur growth plates to have longer legs,what do you think guys? That's too bad this guy had no luck making any gains. How long did it take you to gain an inch Tyler? Are you still 5'10"? How come the few success stories of LSJL that we've heard about so far were mostly with 30-60 seconds of loading? Tyler can you do some research on hexarelin? Tyler i think the solution for growth taller is heavy ankle weights over 20 lbs to create big fractures and then a optimal gh level to heal them by octoblast activity..or as at the moment there isnt a way to induce growth on adults. Lsjl only worked for like 5 person of over 5000 that had tried... Must be a global method. what evidence is there to support joint loading can lengthen bones that have already matured?? I got the same questions,studies are in rats and not human,also people who had claim to got height increase are not oficial for us.need to apply an universal way to be sure in fact they growth. Isn't the increase in knee thickness just an anticipated response to the stress applied from performing lsjl (wolff's law)? What makes you think it's even possible to create a new growth plate from mechanical loading? Has Zhang conducted any loading experiments on mice whose growth plates have chemically been fused? What about igf-1 injections into adult "growth plates?" What does Zhang think about any of this?